In 2017, the Chinese underworld dragon known to guard buried treasures will pay Mr. Sloto a visit – and you too! Kick-start the New Year in company of this mythical creature when spinning the 5 reels of our new slot Fucanglong! Deposit as little as $30 and spin this All Ways Pays slot with a 111% Match + 33 Free Spins! Fucanglong will take you on a most fabled adventure to a land of precious treasures hidden within the reels. The Wild Dragon, the two Scatter Dragon Pearl and Dragon Mountain symbols and more will help you win by triggering free spins, prizes with multipliers and the special Fucanglong feature! 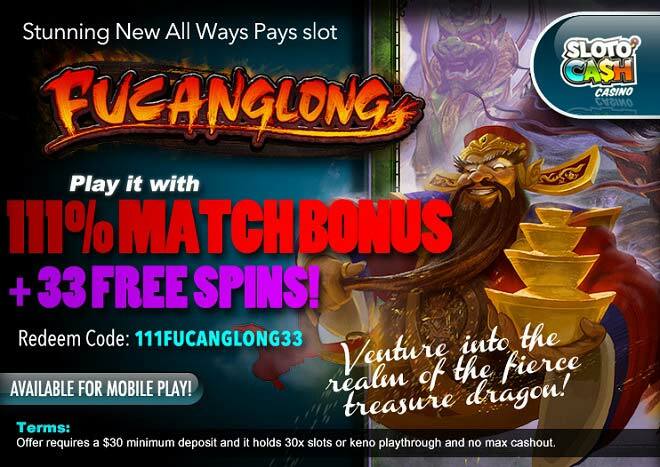 Fucanglong will keep you company this New Year as you spin for hidden treasures with a 111% Match Bonus + 33 Free Spins!